When we arrived at No. 9 Park some of our party was already there. Immediately to the left of the door, the hostess had us wait in a small area with bench seating next to the front windows. There, a bar server came to take our drink order while we waited for them to set our table. Already, the service was top notch and within moments, our table was ready for us. The restaurant, like many in Boston, seemed to try to maximize as much space as possible in a small area. The tables were not as close together as some might be in the North End eateries, but instead they seemed placed in odd places so that servers and other restaurant patrons would need to squeeze by some of the chairs that almost blocked the aisles. The lighting created a kind of yellow, dim tone, for intimacy despite the somewhat close quarters, but it was not so dim that it was hard to see. As we were seated, I ordered a Palmyra off of the cocktail menu as my first drink of the night. It is a mix of organic vodka, lime juice, sugar/simple syrup, and mint. Basically, it tastes like a lemonade with vodka in it, so it was perfect for a summer night. The price is pretty standard for Boston cocktail drinks (low teens), but like all drinks in Boston, overpriced. After hearing about the ban on foie gras in California, I thought I would get my foie gras in while I could before MA decides to join in on the silliness (don’t get me wrong, I’m not an advocate for animal cruelty, but foie gras is hardly the biggest concern on my list). The dish came out and the presentation was very well put together. 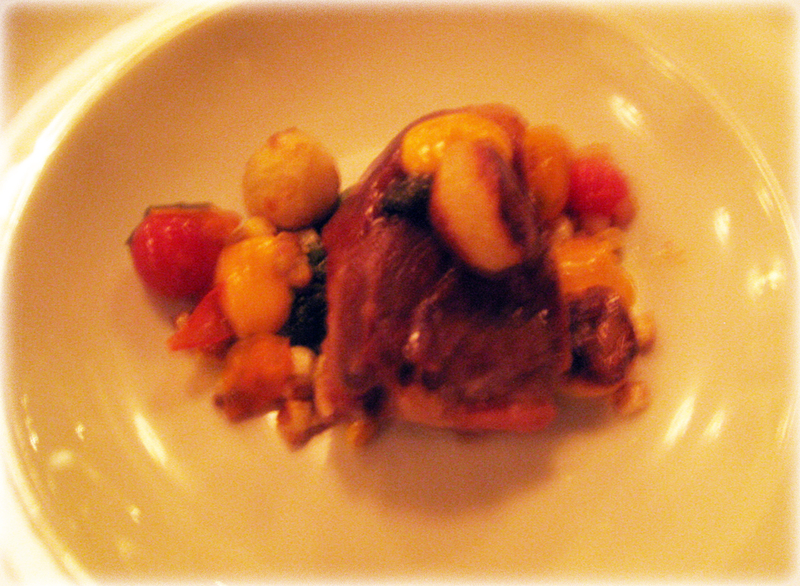 The foie gras balanced on top of a patty-like bed of seared duck confit. Next to the foie gras was a kind of doughy corn cake that was more about texture than taste and provided some starch to the course. 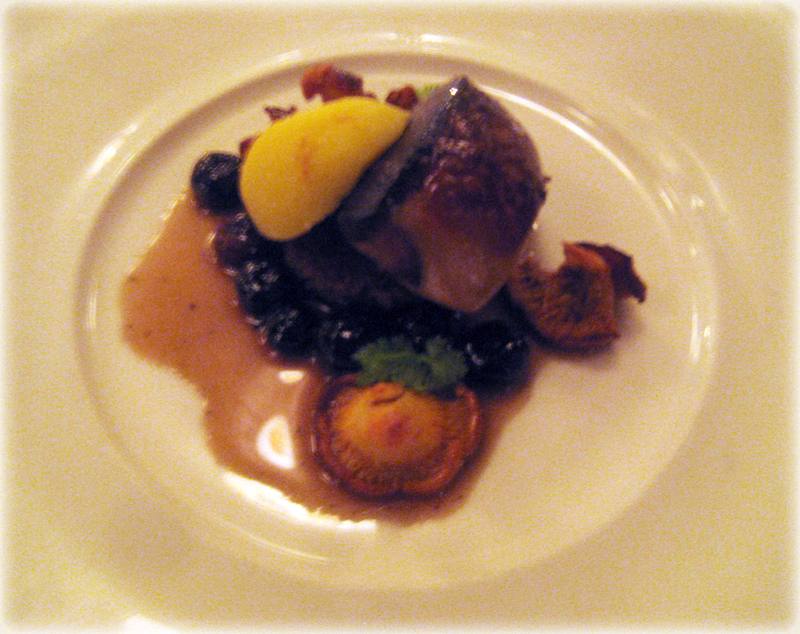 The plate had a few chanterelle mushrooms and balsamic soaked blueberries scattered about as well. I have to admit that while everything on the plate worked well together, I wasn’t a very big fan of the blueberries. I thought they tasted odd paired with the fattiness of the foie gras and confit. I usually enjoy sweetness paired with savory items, but the blueberries may have been too sweet and tart to really blend well. The mushrooms had strong mushroom flavor, but did not overpower the other items. The duck confit was a little over-seared because the patty formed was so thin meaning that the tougher outside was more of the confit than the softer inside. It still had great duck flavor and even though it was a little greasy, didn’t feel too heavy because the portion was just right. Lastly, the foie gras itself was a small piece, but definitely enough to get full effect. This was my first time having this kind of preparation of a pan seared foie gras, so the soft, almost buttery texture was new to me. I had tried foie gras before, but it had a firmer velvety texture and wasn’t pan seared. Overall, the foie gras was delicious, but I was disappointed that one side of the foie gras was basically over-seared so it seemed burned. The dish was definitely heavy in terms of flavor, but that is a good thing for people that enjoy heartier meals. I also tasted the Salmon tartare that someone else in my party ordered, which, quite frankly, was amazing. It had that fresh taste of raw salmon without the fishiness salmon usually gets during the cooking process. The almond, dill, and shaved vegetables made this dish the opposite of the foie gras because it was light and refreshing. I would recommend the salmon tartare over the foie gras during the summer simply because it was cool and light in addition to delicious. The foie gras would definitely be something I would rather have on a colder evening. Between the first and second courses, I needed a refill on my drink. Coincidentally, the same day I ate at No. 9 Park I also just learned about a drink called a Scoff Law from the Putney Farm Blog’s weekly cockatil (a really great blog, you should follow). 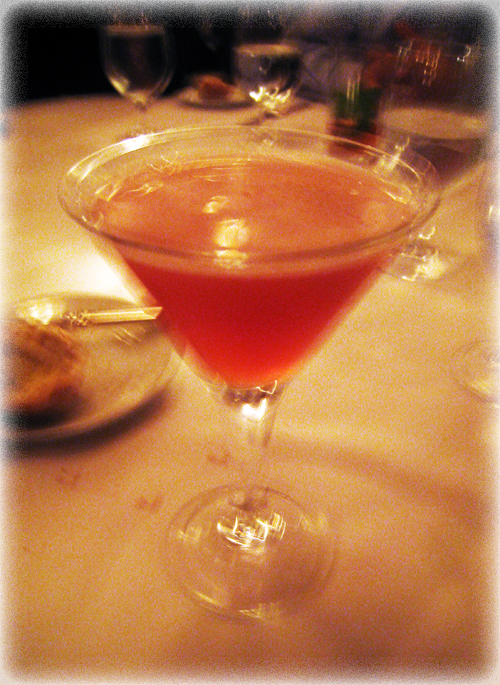 The drink is a rye drink with orange bitters, lime juice, grenadine, and dry vermouth. I’m not a big fan of bitters in general, but orange bitters isn’t bad. This drink tasted the way I would want an old fashioned to taste (i.e. more fruity and less bitters flavor). As a prohibition era drink, I enjoyed this taste of history and I would definitely get it again. The only problem with drink orders at No. 9 Park is that it seems to take a long time before you get your drink after placing an order. 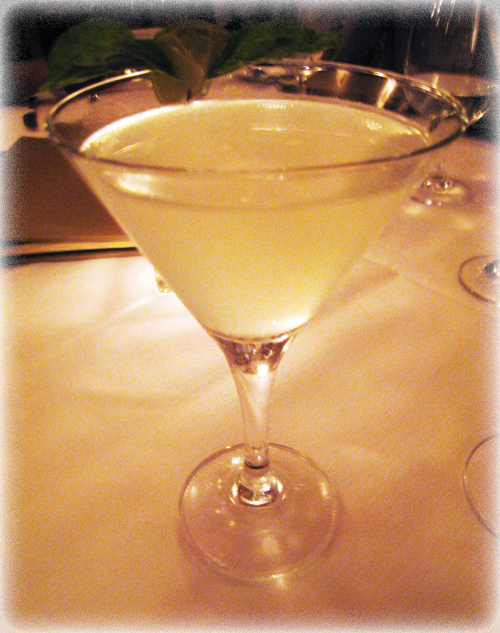 While sipping on my Scoff Law, the second course came out in two waves as two servers placed our dishes in front of us. I thought I would continue on the confit train and order the Pork Shoulder Confit dish. This came as a small piece of pork over some pan sauteed greens, corn, and little mini-potatoes. Every ingredient in the dish worked well with the rest of the ingredients and the earthy vegetables complimented the pork. Unfortunately, I wish I could say that I enjoyed this dish. While edible, the best part of the dish was the vegetables. The pork shoulder was extremely disappointing. It was cooked almost the point of toughness except for the pieces of fat globs scattered throughout the piece of meat. I understand that pork shoulder is a fattier cut of meat, but I’ve had pork shoulder before (even made it myself – stay tuned for my smoked pork shoulder recipe), but this was a very low quality cut of meat. The best likeness I can give it, is that it tasted similarly to Colombian Chicharron, which is fried pork rinds (the real stuff, not the stuff that comes mass produced in bags) and sells for like $2 a piece. It had the same kind of fatty greasiness, but without the crunchy, fried texture that would make it good. This was just a very sad dish to have on the menu of a high class restaurant. I tasted someone’s Hake dish and it was much much better, so I would have preferred to have that lighter dish even though the crab-cake patty underneath the fish didn’t taste very fresh. Nothing really appealed to me on the dessert menu right away since I don’t really enjoy lemon desserts. There was also a honey infused panna cotta, which looked interesting, but seemed kind of plain. I ordered the chocolate dessert because it seemed safe enough after my disappointing second course. 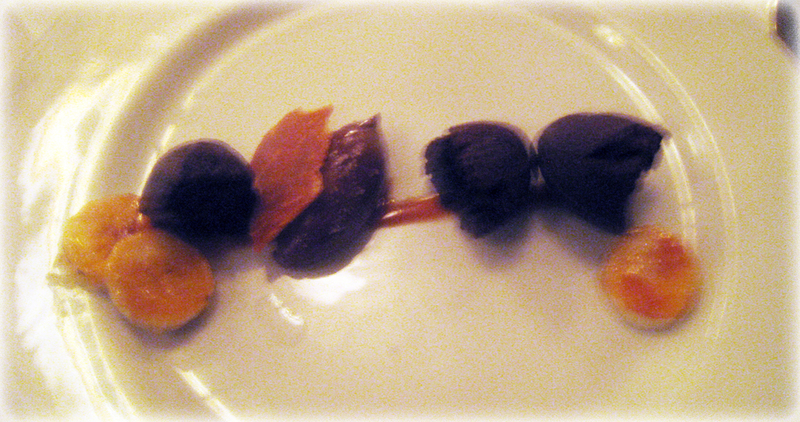 The star of this dish was the chocolate ganache sitting on a line of caramel, surrounded by a few pieces of chocolately biscuit, and candied bananas. That all sounds much more tasty than it actually was. The arrangement on the plate was adequate, but the chocolate cake biscuits (for lack of a better description) looked messily placed and hand broken. The candied bananas had a lightly crunchy sugar shell, but somehow they tasted a little bitter and not what I imagined they should taste like. They could have been better overall. The chocolatey biscuit was dry, but kind of soft. It would probably have been better if it was crunchy or just actual cake. The in between texture didn’t really work. Lastly, the ganache was good, but extremely rich and heavy. I couldn’t even finish it because it was so sweet. The lemon dessert was probably the best dessert, but I’m the wrong person to make that call and the custard tasted overwhelmingly like pure honey. Generally, I’ve had better desserts across the board, so for a restaurant with such a prominent reputation this was disappointing. The only other drawback to the dessert course was that all but one of our party received dessert at the same time. We sat there waiting for the servers to bring the last dessert. Bringing dishes out at the same time for all members of a party seems like a fairly elementary concept for most restaurants, so it felt a little odd for this to happen somewhere like No. 9 Park. I’m glad I tried this restaurant, but I don’t think I will return. There are just so many better places to spend the kind of money a restaurant like this requires. I would suggest stopping in for one of their cocktails though if you want a classy atmosphere and a sweet drink with fresh ingredients. I’ve heard from more than a few people that a lot of restaurants during restaurant week tend to skimp on quality because of the cheaper prices diners are paying. This may have been the case here as well. What bothered me most about this restaurant was that they abused the word confit. Typically speaking confit is a fancy word for a very plain and old way of preserving food in its own fat. Restaurants typically serve this lower quality of meat flavored with its own fat and spices while people today think it’s all very classy. Many restaurants tend to get away with pawning off lower quality products for higher prices simply by using fancy names like confit. Confit can be wonderful, but if you’re going to do this, you should at least make the preparation high quality rather than trying to let the name do all the work. Rating: A large hairless chihuahua. *Apologies for the poor photo quality. Like, I said, it was dark in there and I didn’t want to use my flash on my crappy camera to take the photos. Nice post- and many thanks for the mention. Glad you enjoyed the drink!